New research suggests that climate change following massive volcanic eruptions drove Neanderthals to extinction and cleared the way for modern humans to thrive in Europe and Asia. The research, led by Liubov Vitaliena Golovanova and Vladimir Borisovich Doronichev of the ANO Laboratory of Prehistory in St. Petersburg, Russia, is reported in the October issue of Current Anthropology. "[W]e offer the hypothesis that the Neanderthal demise occurred abruptly (on a geological time-scale) … after the most powerful volcanic activity in western Eurasia during the period of Neanderthal evolutionary history," the researchers write. "[T]his catastrophe not only drastically destroyed the ecological niches of Neanderthal populations but also caused their mass physical depopulation." Evidence for the catastrophe comes from Mezmaiskaya cave in the Caucasus Mountains of southern Russia, a site rich in Neanderthal bones and artifacts. Recent excavations of the cave revealed two distinct layers of volcanic ash that coincide with large-scale volcanic events that occurred around 40,000 years ago, the researchers say. Geological layers containing the ashes also hold evidence of an abrupt and potentially devastating climate change. Sediment samples from the two layers reveal greatly reduced pollen concentrations compared to surrounding layers. That's an indication of a dramatic shift to a cooler and dryer climate, the researchers say. Further, the second of the two eruptions seems to mark the end of Neanderthal presence at Mezmaiskaya. Numerous Neanderthal bones, stone tools, and the bones of prey animals have been found in the geological layers below the second ash deposit, but none are found above it. The ash layers correspond chronologically to what is known as the Campanian Ignimbrite super-eruption which occurred around 40,000 years ago in modern day Italy, and a smaller eruption thought to have occurred around the same time in the Caucasus Mountains. The researchers argue that these eruptions caused a "volcanic winter" as ash clouds obscured the sun's rays, possibly for years. The climatic shift devastated the region's ecosystems, "possibly resulting in the mass death of hominins and prey animals and the severe alteration of foraging zones." Anthropologists have long puzzled over the disappearance of the Neanderthals and the apparently concurrent rise of modern humans. Was there some sort of advantage that helped early modern humans out-compete their doomed cousins? This research suggests that advantage may have been simple geographic location. "Early moderns initially occupied the more southern parts of western Eurasia and Africa and thus avoided much of the direct impact of the … eruptions," the researchers write. And while advances in hunting techniques and social structure clearly aided the survival of modern humans as they moved north, they "may have further benefited from the Neanderthal population vacuum in Europe, allowing wider colonization and the establishment of strong source populations in northern Eurasia." While the researchers stress that more data from other areas in Eurasia are needed to fully test the volcanic hypothesis, they believe the Mezmaiskaya cave offers "important supporting evidence" for the idea of a volcanic extinction. The oldest evidence of the dinosaur lineage—fossilized tracks—is described in Proceedings of the Royal Society B. Just one or two million years after the massive Permian-Triassic extinction, an animal smaller than a house cat walked across fine mud in what is now Poland. This fossilized trackway places the very closest relatives of dinosaurs on Earth about 250 million years ago—5 to 9 million years earlier than previously described fossilized skeletal material has indicated. The paper also described the 246-million-year-old Sphingopus footprints, the oldest evidence of a bipedal and large-bodied dinosaur. Because all of these features are seen in footprints at the oldest site, Brusatte and colleagues conclude that the Stryczowice prints—which are only a few centimeters in length—are the oldest evidence of the dinosaur lineage. These dinosaurs, though, are considered "stem dinosaurs," or the immediate relatives of dinosaurs not part of the slightly more derived clade that technically defines dinosaurs. 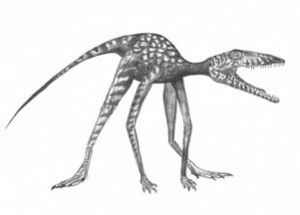 Also, this animal did walk on all four limbs, an abnormal posture for early dinosaurs and their close relatives, although it appears that its forelimbs were already being reduced to more dinosaur-like proportions since the footprints overstep handprints. The Baranów and Wióry trackways show changes early in the evolutionary history of dinosaurs. Wióry at 248 million years ago shows slight diversification in the types of tracks, but all tracks remain quadrupedal. Footprints from Baranów at 246 million years ago, however, may be the earliest evidence of moderately large-bodied and bipedal true dinosaurs. These tracks, which are called Sphingopus, are 15 centimeters long. Finally, although the dinosaur group emerged soon after the Permian extinction, dinosaur-like tracks are rare in the footprint assemblages, representing only 2 percent of the prints discovered as opposed to 40 percent for crocodile-like archosaurs. Dinosaurs became more abundant tens of millions of years later. "For the first 20 million years of dinosaur history, dinosaurs and their closest relatives were living in the shadow of their much more diverse, successful, and abundant crocodile-like cousins," says Brusatte. "The oldest dinosaurs were small and rare." The achievement, which is the result of more than five years of effort, is described by Professor of Chemistry Piotr Kaszynski and graduate student Bryan Ringstrand in a pair of articles published online on Sept. 24 and Sept. 28 in the Journal of Materials Chemistry. "We have created liquid crystals with an unprecedented electric dipole, more than twice that of existing liquid crystals," says Kaszynski. Electric dipoles are created in molecules by the separation of positive and negative charges. The stronger the charges and the greater the distance between them, the larger the electric dipole they produce. In liquid crystals, the electric dipole is associated with the threshold voltage: the minimum voltage at which the liquid crystal operates. Higher dipoles allow lower threshold voltages. In addition, the dipole is a key factor in how fast liquid crystals can switch between bright and dark states. At a given voltage, liquid crystals with higher dipoles switch faster than those with lower dipoles. Vanderbilt has applied for a patent on the new class of materials. Some of the companies that manufacture liquid crystals for commercial applications have expressed interest and are currently evaluating it. "Our liquid crystals have basic properties that make them suitable for practical applications, but they must be tested for durability, lifetime and similar characteristics before they can be used in commercial products," Kaszynski says. If it passes commercial testing, the new class of liquid crystals will be added to the complex molecular mixtures that are used in liquid crystal displays. These blends combine different types of liquid crystals and other additives that are used to fine-tune their characteristics, including viscosity, temperature range, optical properties, electrical properties and chemical stability. There are dozens of different designs for liquid crystal displays and each requires a slightly different blend. The newly discovered liquid crystals are not only important commercially but they are also important scientifically. Since 1888 when they were discovered, scientists have discovered more than 100,000 natural and synthetic compounds that have a liquid crystal state. They have determined that one of the prerequisites for such a state is that the molecule must be shaped like either a rod or a disc. A second requirement is that it must contain both rigid and flexible parts. It takes a delicate balance of two opposing factors or forces to produce a material halfway between a crystal and a liquid. However, there is still a great deal about this unusual state that scientists do not yet understand. For example, scientists are still trying to determine the effect that a liquid crystal's electric dipole has on the temperature at which it becomes an ordinary liquid. The current consensus has been that increasing the strength of the dipole typically raises this transition temperature. The way in which the new type of liquid crystals are synthesized allowed Kaszynski and Ringstrand to test this theory by creating pairs of liquid crystals with the same geometry but different electric dipoles and measuring their transition temperatures. They found that subtle structural differences have a much greater effect on the transition temperature than do variations in the strength of the electric dipole. 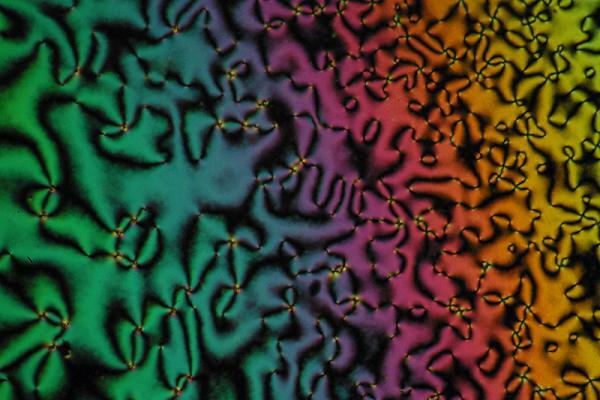 What distinguishes the new class of liquid crystals is its "zwitterionic" structure. Zwitterions are chemical compounds that have a total net electrical charge of zero but contain positively and negatively charged groups. The newly developed liquid crystals contain a zwitterion made up of a negatively charged inorganic portion and a positively charged organic portion. Kaszynski first got the idea of making zwitterionic liquid crystals nearly 17 years ago when he first arrived at Vanderbilt. However, a critical piece of chemistry required to do so was missing. It wasn't until 2002 when German chemists discovered the chemical procedure that made it possible for the Vanderbilt researchers to succeed in this effort. 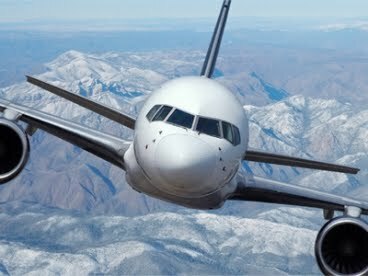 Optical gyroscopes, also known as rotation sensors, are widely used as a navigational tool in vehicles from ships to airplanes, measuring the rotation rates of a vehicle on three axes to evaluate its exact position and orientation. Prof. Koby Scheuer of Tel Aviv University's School of Physical Engineering is now scaling down this crucial sensing technology for use in smartphones, medical equipment and more futuristic technologies. Working in collaboration with Israel's Department of Defense, Prof. Scheuer and his team of researchers have developed nano-sized optical gyroscopes that can fit on the head of a pin — and, more usefully, on an average-sized computer chip — without compromising the device's sensitivity. These gyroscopes will have the ability to pick up smaller rotation rates, delivering higher accuracy while maintaining smaller dimensions, he says. The research was recently described in the journal Optics Express. 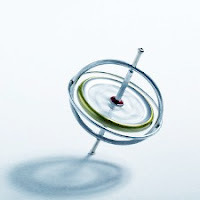 "Conventional gyroscopes look like a box, and weigh two or three pounds," Prof. Scheuer explains. "This is fine for an airplane, but if you're trying to fit a gyroscope onto a smaller piece of technology, such as a cellphone, the accuracy will be severely limited." At the core of the new device are extremely small semi-conductor lasers. As the devices start to rotate, the properties of the light produced by the lasers changes, including the light's intensity and wavelength. Rotation rates can be determined by measuring these differences. These lasers are a few tens-of-micrometers in diameter, as compared to the conventional gyroscope, which measures about 6 to 8 inches, says Prof. Scheuer. The device itself, when finished, will look like a small computer chip. Measuring a millimeter by a millimeter (0.04 inches by 0.04 inches), about the size of a grain of sand, the device can be built onto a larger chip that also contains other necessary electronics. Prof. Scheuer and his team of researchers are currently working on lab demonstrators of the device, which he predicts will be ready for testing in a few years' time. When available, the nano-gyroscopes will improve technologies that we use every day. When you rotate an iPhone, for example, the screen adjusts itself accordingly. A nano-gyroscope would improve the performance of this feature and be sensitive to smaller changes in position, says Prof. Scheuer. And that's not all. Nano-gyroscopes integrated into common cellphones could provide a tracking function beyond the capabilities of existing GPS systems. "If you find yourself in a place without reception, you would be able to track your exact position without the GPS signal," he says. There are benefits to medical science as well. Right now, small capsules that contain cameras pass through the body during some diagnostic procedures, but to know where the capsule is within a patient, doctors must track its signal from the outside. With the addition of a nano-gyroscope, explains Prof. Scheuer, the capsule would have a built-in navigation system, which would provide the ability to move the capsule to more specific and precise locations within the body. For many blind people, computers are inaccessible. It can cost upwards of $1000 to purchase "screen reader" software, but two blind computer programmers have solved this problem. 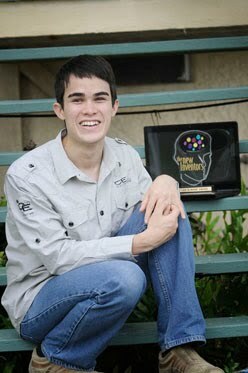 The invention won the blind duo accolades in the grand final program of the ABC's iconic New Inventors, which aired on September 23. They took home the "Les* is More" award, for an invention that "might make a real difference to people's lives or the environment." "We really are in the information age - everything is online these days. So access to computers for the blind and vision impaired is incredibly important, which is why we wanted our software to be free." "After our initial appearance on the New Inventors in March, we have definitely had more organisations and users interested in our product," Mr Teh said. "It was amazing to think we were selected from the five finalists to win. We are very happy, proud and honoured." A growth-factor chain of action that prompts bone marrow stem cells to repair cardiac tissue and reverse heart failure has been identified by researchers at the University at Buffalo's Center for Research in Cardiovascular Medicine. Earlier research from this group showed for the first time that injecting mesenchymal (bone marrow) stem cells into skeletal muscle in an animal model increased two-fold the production of myocytes, a type of heart muscle cell. 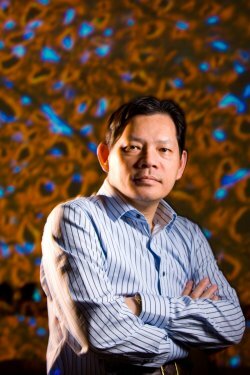 "By thoroughly understanding the interplay of stem cells and host tissue, and characterizing stem-cell-derived growth factors," says Techung Lee, PhD, senior author on both papers, "it is possible to assemble a cocktail of these factors and use it for tissue repair, much like the use of insulin for diabetes patients." Lee is associate professor of biochemistry and biomedical engineering in the UB School of Medicine and Biomedical Sciences and the School of Engineering and Applied Sciences, respectively. Bone marrow mesenchymal stem cells [MSCs] possess an impressive ability to produce a plethora of growth factors, most of which remain to be characterized, Lee says. "These growth factors appear to account for most of the observed therapeutic benefits in preclinical and clinical studies. Using skeletal muscle as a depot for the injected MSCs, we found that the MSC-derived growth factors activate production of host muscle tissue-derived growth factors." The heart disease death rate has dropped significantly in the last three decades due to better treatments, resulting in large numbers of people living with heart failure. However, heart transplantation is the only therapy currently available to reverse the continual decline in heart function, and donor hearts are scarce. Lee notes that current clinical trials of myocardial stem cell therapy require surgery, injecting the cells directly into the heart or into the heart muscle, invasive methods that can result in harmful scar tissue, arrhythmia, calcification or small vessel blockages. Lee's research group found that only 1-to-2 percent of MSCs infused into the myocardium actually grafted into the heart, and there was no evidence that they differentiated into heart muscle cells. "For these reasons, and because patients with heart failure are not good surgical risks, it made sense to explore a non-invasive cell delivery approach," Lee notes. Lee's group has shown that the instructive signal that generates the repair of cardiac tissue appears to come from at least a group of MSC-derived factors belonging to the IL-6 type cytokine family. Cytokines are small proteins made by the cells that act on other cells to stimulate or inhibit their function. "These IL-6 type cytokines typically activate their cell/tissue targets through two specific proteins, known as JAK and STAT3, a cytosolic and a nuclear protein, respectively," explains Lee. "These cytokines then instruct the host cell to produce another panel of growth factors. "The combined effects of the growth factors from injected stem cells and growth factors produced by host tissues cause tissue repair and achieve healing. Being able to use the factors for therapy rather than stem cells will make therapy to repair hearts much easier," he says.